The best way to spread Holiday Cheer, is singing loud for all to hear! Officially licensed Elf Movie t-shirts and gifts. Buddy the Elf approved! We've got an awesome collection of The Best Way to Spread Holiday Cheer Elf T-Shirts, hoodies, gifts and more. 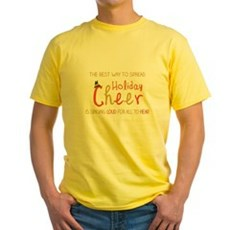 We specialize in The Best Way to Spread Holiday Cheer Elf T-Shirts and many more funny, vintage and retro t-shirts. Featuring Funny Christmas T-Shirts, X-Mas T-Shirts and Funny Christmas Tees. All orders come with a 30 day money-back guarantee and most ship within 24 hours.